Now that fall is officially in full swing, you have many things to look forward to with your child — the first day of school, fall activities like apple picking, and Halloween! However, one aspect of the fall season that you may not be looking forward to is your child getting sick. As a parent, you hate seeing your kiddo feel lousy, and you want to do everything you can to help them feel better as quickly as possible. 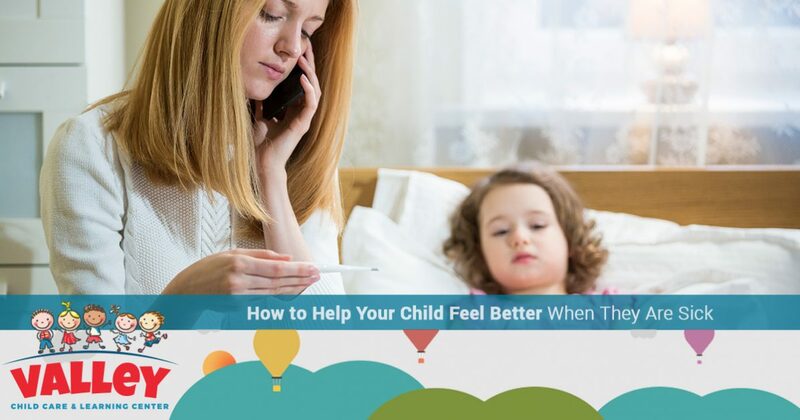 In today’s post, we will give you a few tips on how you can help your child feel better when they’re sick. It’s common for children to catch a cold from one of their classmates at school, and at Valley Child Care and Learning Centers, we do everything we can to keep your child healthy. In addition to ensuring that they eat healthy snacks and lunches, we also care for your child’s safety as if they were our own. Find out more about our education program, child safety policy, and more, and give us a call at one of our 10 Phoenix locations today! When your child is sick, the number one thing you can do to help them feel better is making sure that they drink plenty of fluids. Hydrating will help your little one’s body flush out the toxins, allowing them to feel better sooner. Water is the best source of hydration, but your kiddo can quickly become tired of drinking water, not to mention it does nothing to soothe their sore throat. Try and get them to drink hot tea or a hot apple cider. If they refuse to drink any liquids, you can also give them Jell-o®, which falls under the category of a “clear liquid” and helps hydrate your child without them even realizing it. 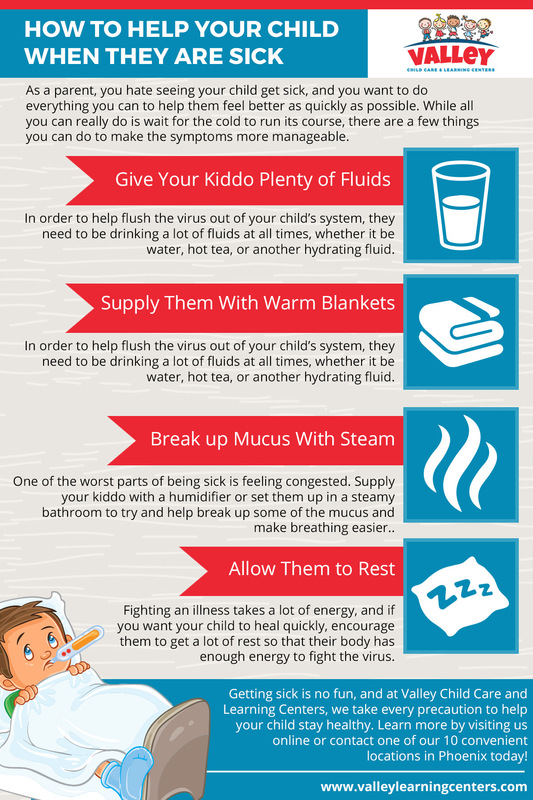 Most colds will result in a fever as your child’s body tries to fight off the illness. While the fever itself can leave your little one feeling pretty lousy, it can also come with hot flashes and chills. For this reason, you want to make sure that your child has plenty of warm blankets within easy reach. At times, they may be too hot for a blanket, but if they have the chills, they will need one or two blankets to keep them warm while their body fights off the illness. One of the worst parts of being sick, aside from the fever, is feeling congested. Depending on the cold, the congested feeling can even sometimes be worse than the illness itself. There are medicines that you can buy over the counter that will help break up mucus, but if they aren’t working, or you don’t want to resort to medicines, then steam can be a great resource. Supply your kiddo with a humidifier while they sleep at night, or have them sit in a steamy bathroom. The steam and humidity will help give them some relief from the congestion. If you want your child to heal as quickly as possible, the best thing that you can do is let them rest. They may want to go outside and play, despite not feeling well, but you should encourage them to take it easy and sleep when their body needs rest. Your body uses a lot of energy when fighting an illness, and it’s important that they replenish that energy by sleeping or doing things that take a minimal amount of energy. 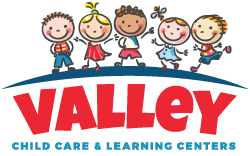 At Valley Child Care and Learning Centers in Phoenix, we know that fall is a big time for children to be sick, and we take the necessary steps to ensure that your child is safe, happy, and healthy. Browse our website to learn more about our education program, child safety policies, and more, and don’t forget to give us a call to get started by enrolling your child!